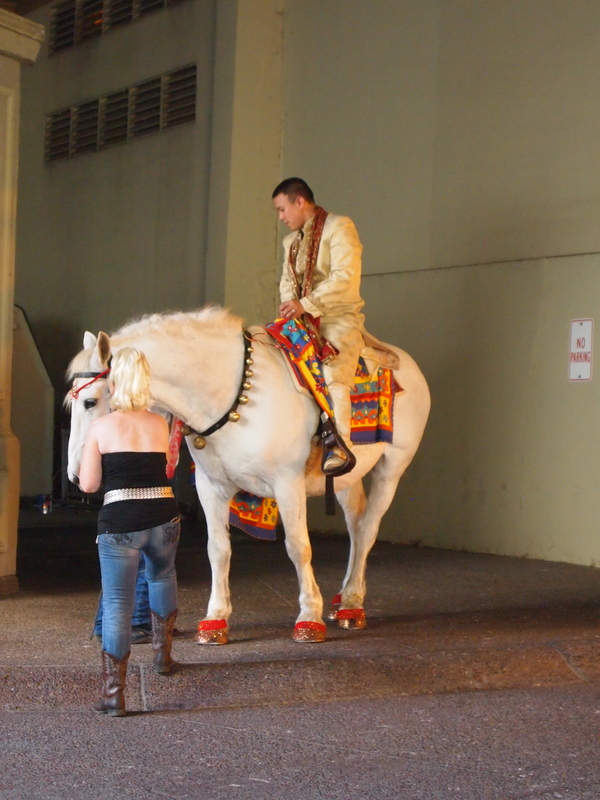 An Indian Wedding: Finishing the night with a horse ride, dinner and dancing! By this point in the wedding festivities, we have seen henna designs, skits, beautiful dresses, delicious food, a stunning bride (and groom! ), and a Nikah wedding ceremony. 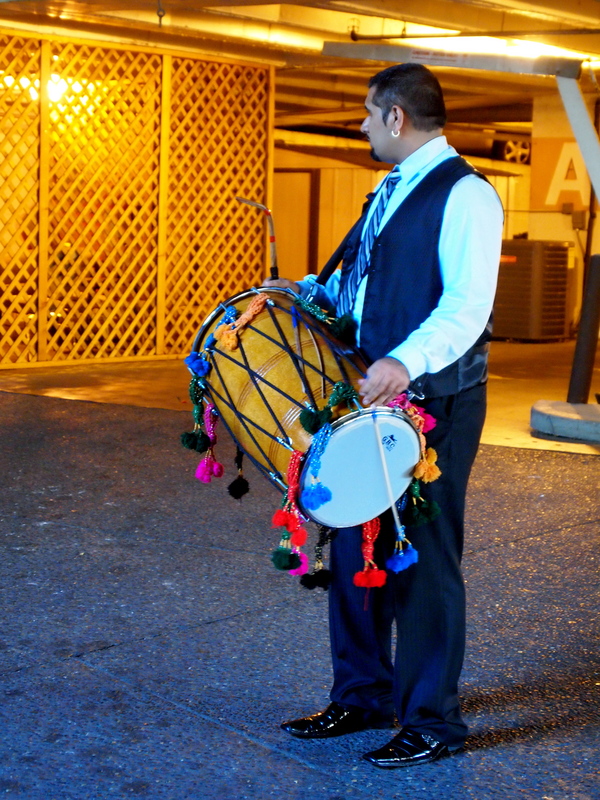 Drumming introduced us to the second part of the wedding festivities on May 5th, 2012, when Noah rode in on a white stallion to the entrance of the reception hall. 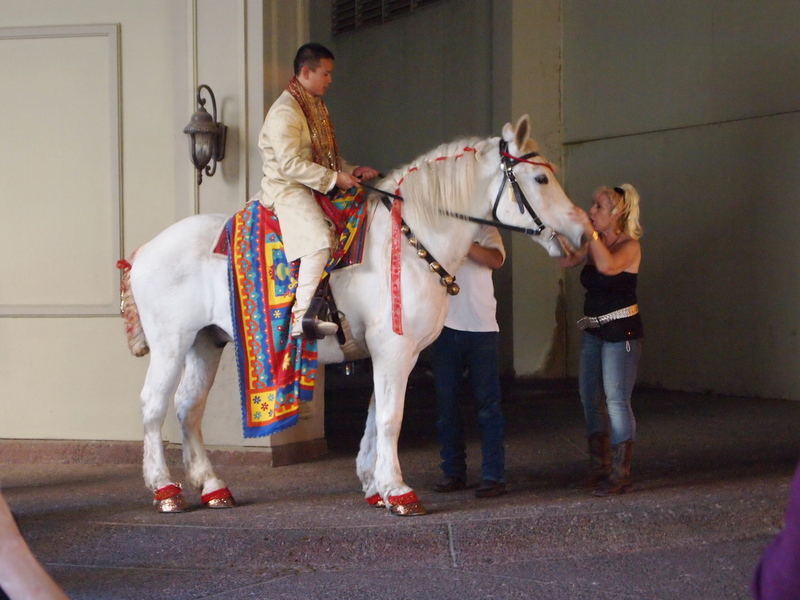 He looked very handsome in his traditional Indian ensemble, and very confident on the enormous white horse they had for him to ride! Once Noah rode in on the horse, Natasha’s cousins and bridesmaids gathered around him to participate in a tradition I had never seen. We stole his shoes! And then he had to negotiate with us to get his shoes back. In the end, he paid a lot of money (I hope pre-arranged) and did a little dance. It was a lot of fun. Following the bartering of the shoes, family members gathered to bless Noah with a coconut. They would stand in front of him, touch the coconut to his forehead, and move the coconut in circles in front of his head. While traditions surrounding Noah’s entrance were taking place, Natasha was upstairs getting changed for the rest of the evening. 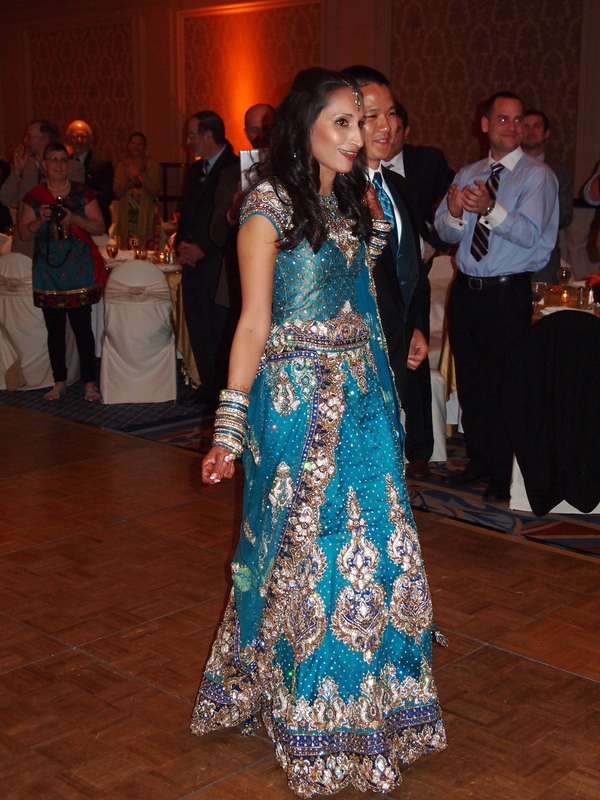 Her second gown was very similar to her first gown, only in teal instead of red. It was absolutely gorgeous! 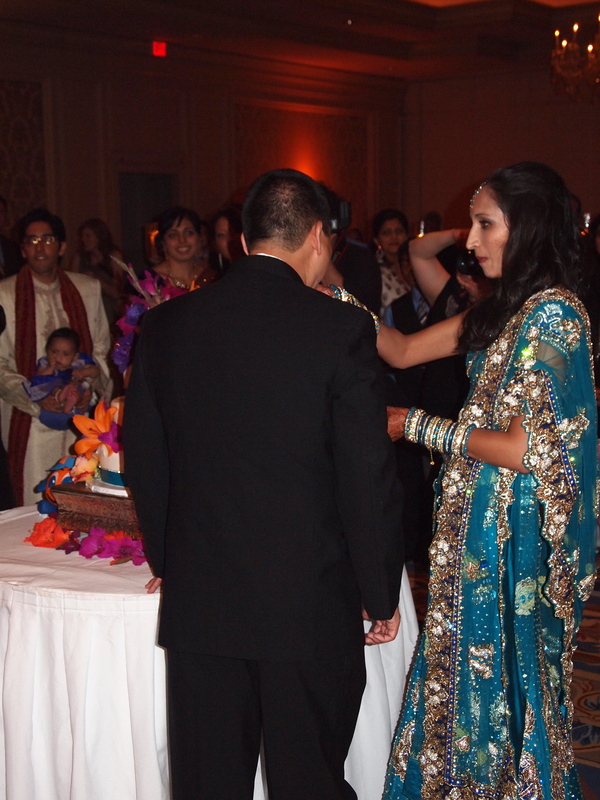 Noah somehow found time to change as well, from his traditional Indian ensemble into a black tux with teal accents. They were quite the handsome couple. 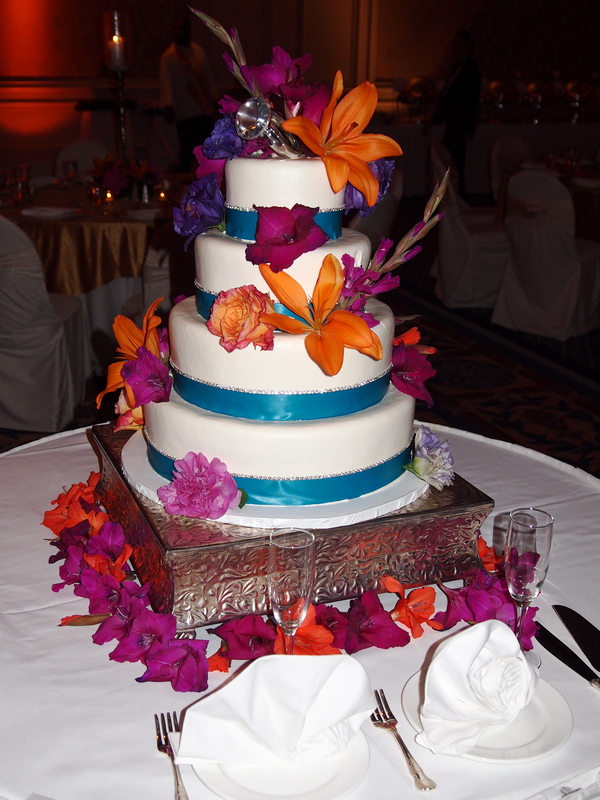 The reception was held in the grand ballroom of the Intercontinental Hotel on the Plaza. Outside the ballroom, the couple had arranged a photo booth for guests to take fun pictures, appetizers, and refreshing beverages to cool off from the heat outside. Once the bride and groom were ready to make their grand entrance, we all moved into the ballroom and anxiously awaited their arrival. The families entered first, with the parents dancing in to pre-selected songs. Then Natasha and Noah entered the room to a song of their own selection. As they strutted their way through the room, you could see the excitement on their faces to have reached this part of the day. Time to let loose and have fun! They started with the cake, and then sat down to have dinner. 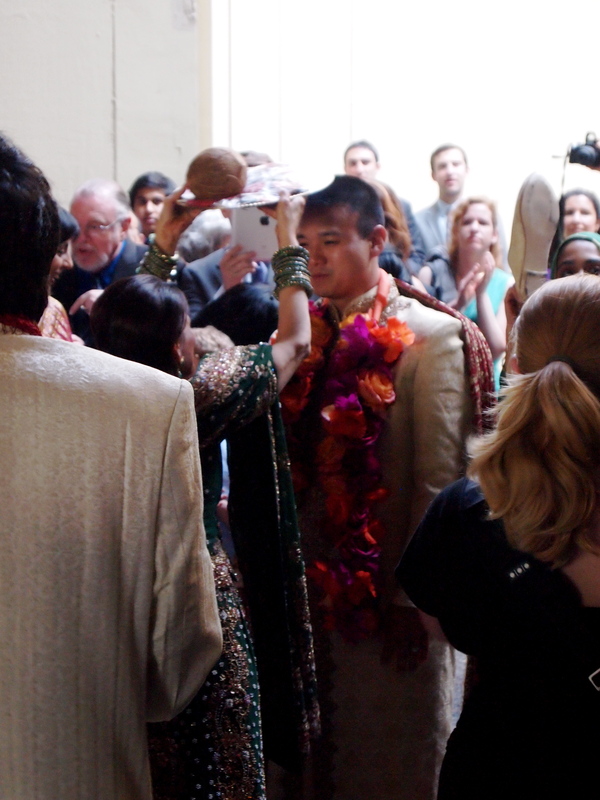 One of my favorite aspects of this wedding was the incorporation of different cultures. Indian traditions from Natasha’s family, Jewish traditions from Noah’s family. 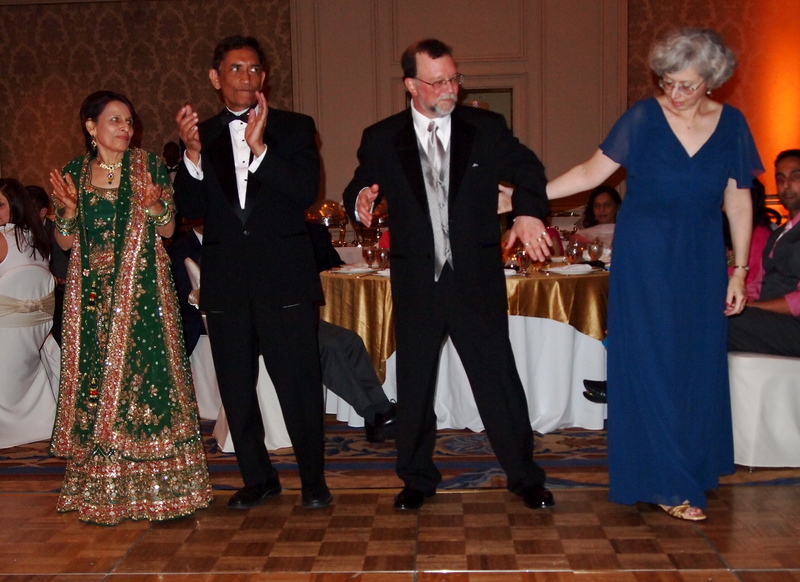 They incorporated prayers from both in the wedding ceremony, and dances from both in the reception. Unfortunately, we didn’t get any pictures of the hora because we were both participating. The bridesmaids joined in the circle, and Jake jumped at the chance to help lift one of the chairs in the center of the circle dance. Such a fabulous time! The surprise guest of the evening was….drum roll please!…..Big Jay! 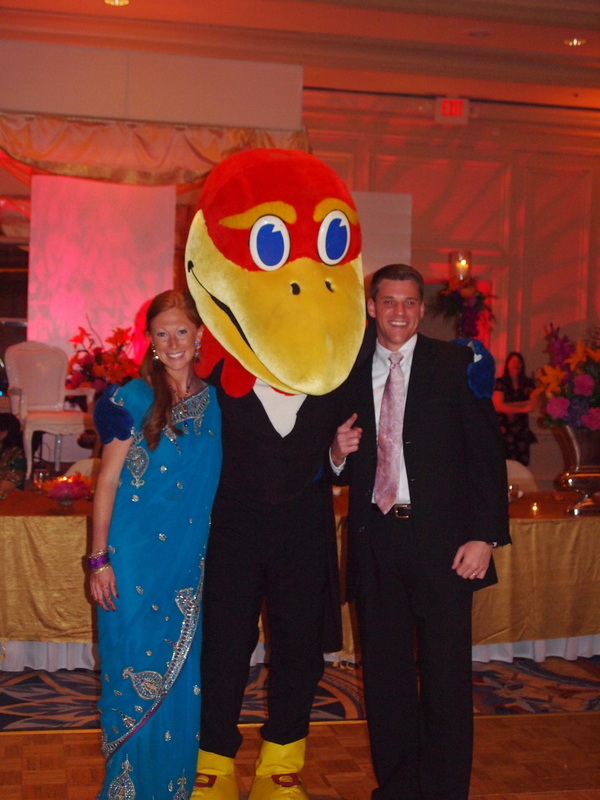 The Kansas Jayhawks mascot joined in the festivities for part of the night, competing in a dance off with a representative from the Syracuse Orangemen. He then stayed to take pictures with all of us. 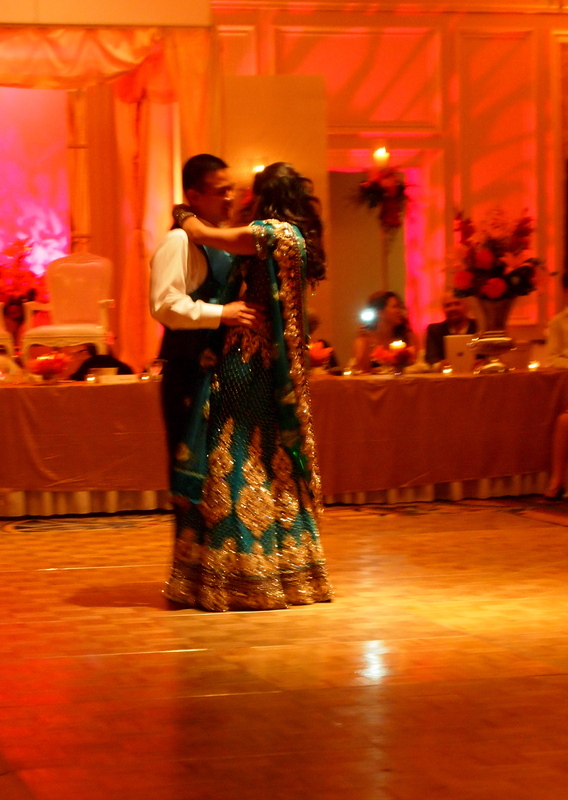 The night finished with a first dance for the bride and groom. It was a beautiful evening and a wonderful way to celebrate the beginning of what I expect to be a strong and happy marriage. Natasha and I have known each other for so long. We grew up together attending Pembroke Hill School, and even created a cool handshake in 5th grade. We played soccer together, learned Spanish together, and still made time to see each other through college. She then went off to med school, while I attended law school. Now, we’re all grown up, with fancy degrees and wonderful husbands. Natasha and Noah, I am so excited for both of you, and I wish you both all the happiness in the world. Congratulations! 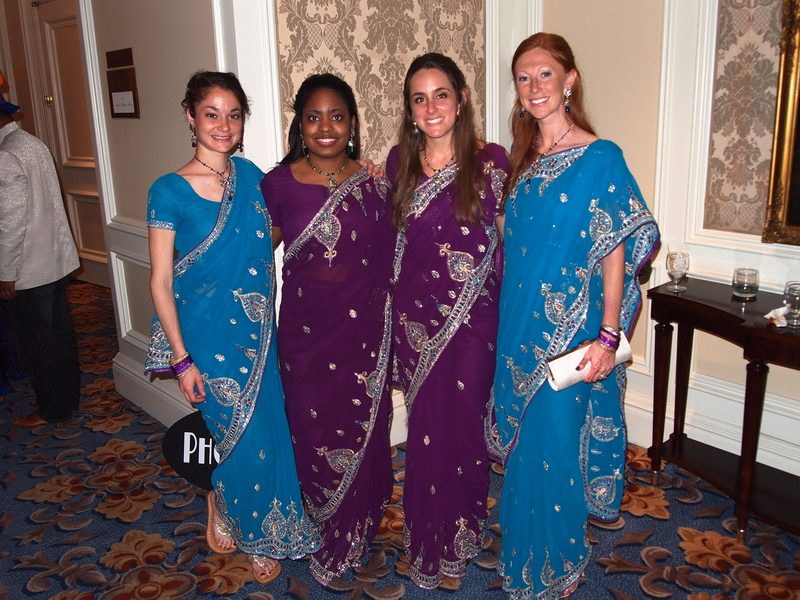 This entry was posted in Culture and tagged Art, balancing wedding traditions, Big Jay, culture, Indian culture, indian wedding traditions, Meg McCollister, multicultural wedding, Natasha Ahmed, Natasha and Noah, Noah Weichselbaum, Pembroke Hill, Pembroke Hill Alumni, Photography. Bookmark the permalink.